A six-unit classroom block funded by petroleum revenues in 2014 is in a deplorable state, barely three years after its construction. A total of GH¢98,823 realised from the sale of oil was allocated as payment for the facility at the Bishop Herman College in the Kpando District in the Volta Region in 2014. The facility was, however, in a deplorable state when a team from the Public Interest and Accountability Committee (PIAC) – the committee with oversight responsibility over the prudent management of oil revenues – and the Institute of Financial and Economic Journalists (IFEJ) visited the school on August 22, as part of a validation exercise on how oil revenues have been used. The windows of the classroom block have no louvre blades while most of the mesh that have been used for the windows were seen to be coming off. 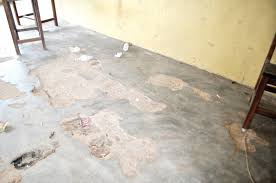 The concrete floors in most of the classrooms and on the veranda were also in a bad state and the rooms designed to be used as washrooms were empty because no facilities were fitted to make it ready for use by the students. Although the block had electrical connections, there were no fans in all the classrooms. The locks to the door were already spoilt and the school authorities have had to secure the doors with nails, to make it inaccessible to intruders and students who would want to use it for their own interest. One of the housemasters at the college who conducted the team round explained that the students started using the facility in 2014, although not completed, because it was habitable at that stage. He, however, explained that barely a year after the students moved in, the building started deteriorating. The rooms were painted and the floors were okay. There were no louvre blades, just wire mesh with nets. As the boys began using the rooms, the floors started deteriorating at a very fast rate. In a year’s time, we started seeing potholes on the floor,” the housemaster, who wanted to remain anonymous, said. He said the school had contacted the contractor (who admitted that the work was not completed) to come and remedy the situation. The contractor has however failed to show up and the facility continues to deteriorate as the students continue to use it. “We reported and we were told they had not finished, and they would come back. But since we reported in 2015, nothing has been done about it,” he added. The housemaster expressed surprise at how some old buildings in the school continued to be in a good state while the new one was rather fast deteriorating. He subsequently blamed it on poor supervision after contracts were allocated for such construction projects. No proper supervision was done because when you even look at the doors, some of the woods were not seasoned or well cured. They were fixed in their fresh state, so if you want to lock, you have to lift it before,” he said.